[Descartes] illustrated this principle by nailing live dogs to barn walls and eviscerating them. While the dogs writhed and screamed, he told the crowd of onlookers that their struggles were merely automatic movements of the body – no more felt by the dog than a clock feels the movement of its hands. Galen’s connecting a walk with my sneakers could have been more Pavlovian than intellectual, but the only explanation I have for why her tail wagging stopped and her face fell when I told her she wasn’t coming with me is that she understood. Fortunately, anecdotes such as this – that point to an intellectual capacity in canines or a thought process of some kind – are starting to have the support of science and scientists who study human and canine brain structure and brain chemistry. It’s just too bad the science wasn’t there for Descartes. Then he could have extended his cogito to canines: They think, therefore they are, and taken a dog or two as a pet rather than using them for sadistic experimentation. Galen, with her favorite ball. Despite others littering our yard, she will play with no other. This entry was posted in Descartes, dogs, Galen. Bookmark the permalink. I love my dogs and both of them, even Cody, can understand what we’re saying. For example, if my mom opens the trunk they know they’re going for a ride. Or if Molson sees suitcases, he lies down on his bed with a disappointed look. Those are great examples of dogs having some type of cognitive thought process, Olivia. For such a brilliant man, Descartes was certainly completely ignorant in his thinking about dogs. Thanks for posting! Hi – was missing weekly updates and remembered to check your blog. Always enjoy reading it. How can people think that dogs don’t feel. Dogs have facial expressions and body movements that tell us they do. 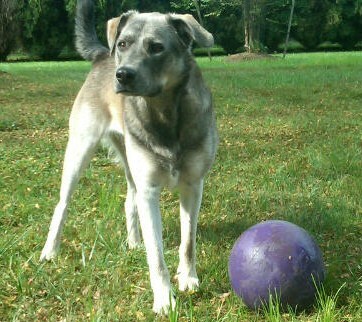 Great picture of Galen with her purple ball.